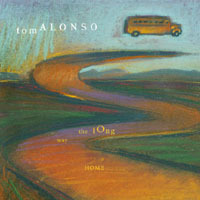 Tom Alonso's sophomore album, The Long Way Home, features numerous examples of Alonso's jazz expertise, as well as beautiful tracks that express his own personal style. The Long Way Home can be purchased on iTunes or Amazon. When I listened to Tom Alonso's jazz musings on THE LONG WAY HOME, I was reminded of an intricate Gershwinesque feel to the music in this outstanding collection of 7 selections. Each selection is long, pleasing, intricate, and backed with a symphonic approach that highlights the solo performances. If you want something creative, while at the same time excellent contemporary jazz in a symphonic mode with a touch of swing, this CD collection will be a highly enjoyable addition to your jazz library. Excellent performances abound! Selections include "The Long Way Home," "Lullaby and Blues," "Shoebooty," among other nice compositions. Excellent production values. For a change of pace, purchase a copy of THE LONG WAY HOME, for it has something to enjoy for everybody who enjoys the motifs of jazz in a contemporary setting. A winner! Backed by an impressive local lineup that includes, but is not limited to: Dennis Chambers, Victor Williams, Jim Charleson, David Rhen, and many others too numerous to mention; Tom Alonso presents a Mid-Atlantic masterpiece with The Long Way Home. Leading off is the instrumental, "Possibilities" a Peanuts-like paean that would make the recently-retired Charles Shultz and his piano protege Schroeder proud! "The Long Way Home" is the perfect follow-up, as the song's building momentum blends perfectly with Alonso's orchestral treatments. His symphonic strategy was never more focused than on this melancholy movement. "Mira La Luna", meanwhile, sports cascading piano and tickled strings that creates an overture reminiscent of Copland's American opus, "Rodeo". The heaven-sent "Our Star" is a collaborative effort with an angelic choir. The composition features strings and timpanis aplenty, and other important pieces of the puzzle bring themselves to the forefront, as horns, flutes, and oboes abound. Alonso also proves himself to be one-man tour-de-force on "Lullaby and Blues", "Shoebooty" and the (almost) 14-minute "New York Soup". On these offerings he is stripped to the bare essentials of his craft: his fingers and the keys on his piano. He is able to pull the heartstrings with a keen understanding of Americana (ala Van Dyke Parks, one of our most gifted homegrown orchestrators, and even Leonard Bernstein, the brilliant mind behind "West Side Story"). Ultimately, The Long Way Home proves that Tom Alonso is much more than impressive keyboard player -- he is also a talented writer, an impressive arranger, and a diligent composer with serious classical leanings.